Go Green for St. Patrick’s Day with Bruegger’s Bagels! Bruegger’s Bagels, known for its authentic New York-style bagels, will celebrate St. Patrick’s Day by baking up green bagels Wednesday, March 16, and Thursday, March 17. The St. Patrick’s Day tradition began in 1997 at a Pittsburgh Bruegger’s Bagels location. This video shows how the shamrock-green bagels are made in the traditional way, first kettle-boiled, and then baked to perfection in small batches throughout the day to ensure freshness. Guests can enjoy them with any of Bruegger’s Bagels’ 100 percent made-in-Vermont cream cheese flavors, or as a base for breakfast or lunch sandwiches. 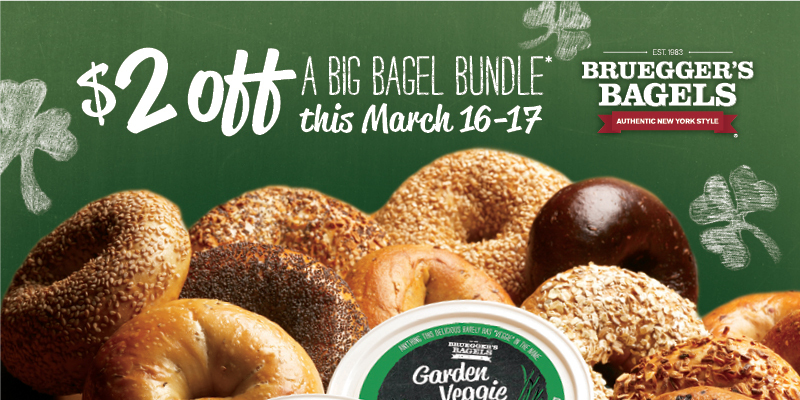 As part of the celebration, Bruegger’s Bagels customers can get $2 off a Big Bagel Bundle, which includes 13 bagels of any variety and two tubs of cream cheese, by downloading a coupon from Brueggers.com. The coupon can be redeemed March 16-17 at participating U.S. locations. Guests ordering a dozen or more green bagels are encouraged to preorder. For location contact information and hours, visit www.brueggers.com. Bruegger’s Enterprises, Inc. (BEI), a leader in the fast casual restaurant segment, operates 275+ Bruegger’s Bagels bakeries in North America. Renowned for its authentic New York-style fresh-baked bagels, the chain also offers a wide variety of freshly prepared breakfast and lunch options made with high-quality, simple ingredients served with its unique brand of hospitality. Bruegger’s Bagels is dedicated to the communities it serves and supports charitable causes locally and nationally. BEI’s parent company, Groupe Le Duff, SA, is the world’s second-largest company in the bakery-cafe sector. Founded in 1983, BEI is headquartered in Dallas.